Welcome to my first ever restaurant review! In the past, I've talked about where to find great vegan food while travelling, but surprisingly I've never talked about the incredible vegan options right here in Ottawa. Over the past few years, Ottawa has really upped their vegan game. One restaurant that I've been really curious about was Pure Kitchen, which is a vegetarian restaurant, but I think the only non-vegan item on the menu is cheese. 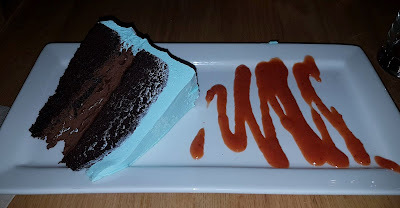 Last week, my friend Meghan and I finally made our way to Pure's Westboro location to see what all of the hype was about. Even on a rainy Tuesday night, Pure Kitchen was packed. We waited at the bar for about 25 minutes before we were seated. Unfortunately, Pure only takes reservations for parties of 5 or more, and they're always busy, so do be prepared to wait a little bit. But I promise that the wait is worth it! The menu isn't overwhelming, but there are still enough options to satisfy anyone's tastes. I ended up ordering the Righteous Neatball Sub with a garden salad, which was absolutely incredible. 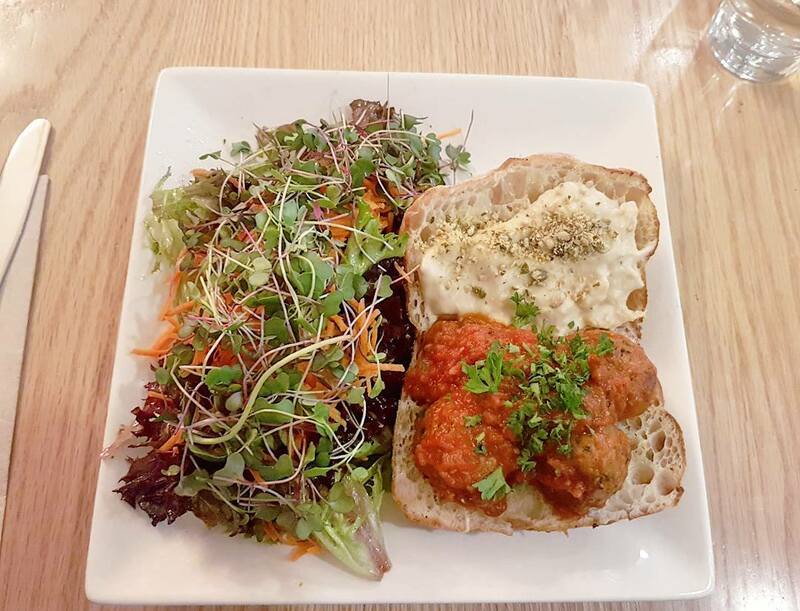 Tempeh "meatballs" drenched in marinara sauce, on a fluffy ciabatta bun, along with vegan mozzarella, parmesan, and garlic butter. I was really impressed with the portion sizes, especially that generous side salad! 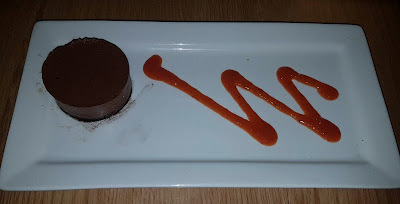 For dessert, I ordered a dark chocolate peanut butter cup that I saw in the display case at the front - also delicious! After taking me years to check out Pure, I ended up returning for my second visit just a few days later. This time I was dining with my husband, mother in law, and grandmother in law. My husband is also vegan, but my in-laws are omni. 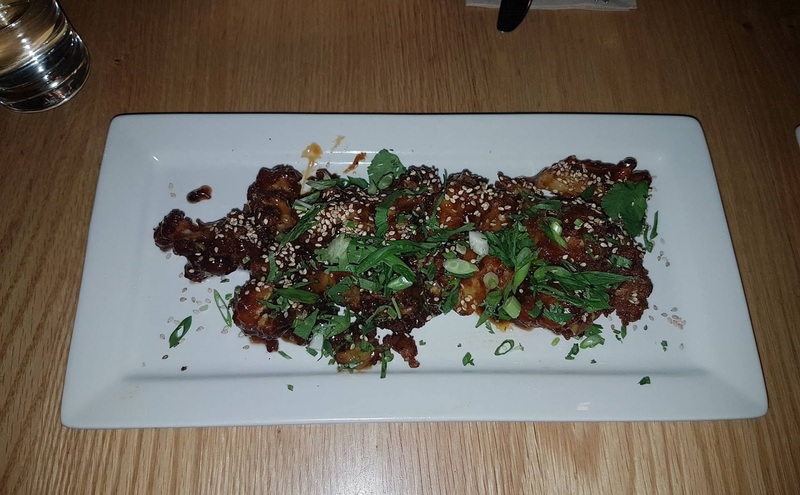 This time we ordered some appetizers - the Radical Cauliflower Wings and Divine Dumplings. The cauli wings were a big hit with the entire table! I've never had dumplings before, but I quite enjoyed Pure's. For a main, I ordered the Liberty Buffalo Cauliflower Wrap. I did ask if this wrap could be made less spicy (it has a pepper beside it on the menu), and my waitress assured me that they could swap out the buffalo sauce for the same sauce they use on the wings, which is a bit sweeter. However, after taking the first bite I realized that the cauliflower was tossed in the original sauce, and was pretty spicy. 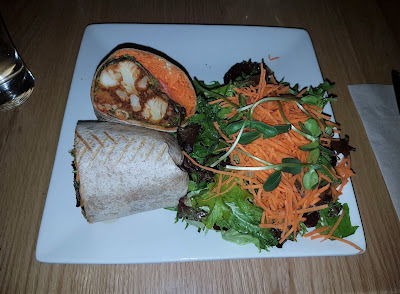 I can't handle spice at all, so I had to alternate bites of the wrap with bites of salad, and sips of water. However, minus the spice, the wrap was really good, as was the salad. After hearing me rave about the meatball sub, Dylan had to try it out for himself. 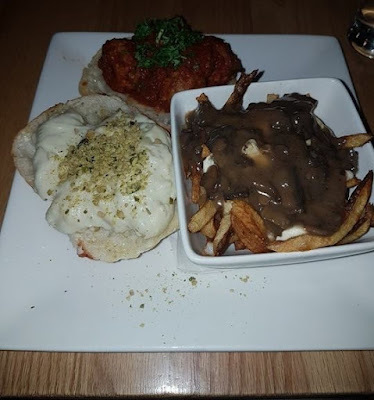 He swapped out the garden salad for vegan poutine, which is made with mushroom gravy and cashew cheese. I mean, a meatball sub and poutine, all veganized, are you kidding me?! Even after all of that food, we somehow still had room for dessert. Once I saw cheesecake on the menu, I was sold. The flavour of the day was chocolate Oreo, which sounded absolutely delightful. I've ordered vegan cheesecake at many restaurants - it's my go-to dessert. So, I've had really incredible vegan cheesecakes, and some that left me wanting more. Unfortunately, this cheesecake from Pure didn't wow me. The texture was just slightly firmer than that of pudding, and the chocolate flavour was quite mild. The Oreo crust was very thin, and just didn't stand out. Also, I found the portion size to be quite small. Dylan made the better dessert choice by ordering the chocolate cake with vanilla frosting. This cake was absolutely delicious, and I'd recommend it over the cheesecake any day. The atmosphere in Pure Kitchen is cozy and welcoming, with a mixture of tables and booths. They have two locations now, one in Centretown at 340 Elgin St, and one in Westboro at 357 Richmond Road. Both locations have the same menu, with separate weekly specials. Expect to pay around $15, for a main dish, which I think is reasonable for the quality of the food and the fresh ingredients. My top picks would be the Radical Cauliflower Wings, Righteous Neatball Sub, and the chocolate cake. Have you checked out Pure Kitchen before? It's so nice to see a veggie restaurant become so popular, and I think that it's a place that vegans and omni's can both enjoy. If you'd like to see more restaurant reviews, please let me know, as I would love to share more of my favourite vegan eateries here in Ottawa! I do need to get more comfortable with food photography though - any tips for taking pictures of your food in a dimly lit space, and getting over the fear of other patrons judging you for taking out your phone?